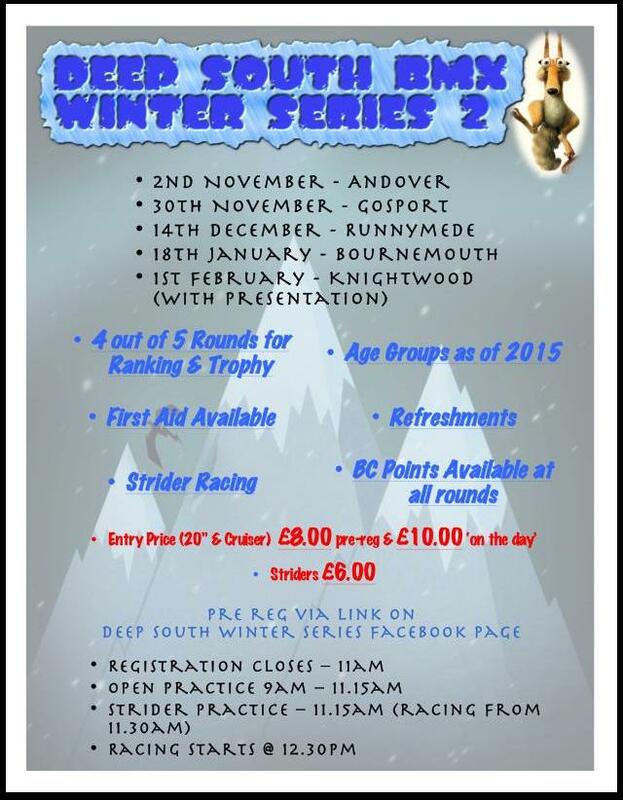 Just found a link for pre registering for next week’s first south region winter series at Andover on Sunday 2nd November. See here for details. Looks like it should be a good race and Andover Track looks like a lot of fun. Strider will start straight after practise with 15min practice and racing from 11.30. Racing for all 20” and 24” classes starts at 12.30. Please make sure you have a number and a plate before the event. Pre-registration closes midnight Wednesday 29th Oct. We will be running with 2015 age groups* (between 1/01/2015 – 31/12/2015). You only need a BC licence if you want to receive National ranking points. This year we are running Strider races – these will be in 2 classes. Half and full lap races with the results based on a Grand Prix system. Price for Striders is £6.00 To achieve an overall result you will need to compete in 4 rounds in the same category. Where there are less than 4 riders categories may be combined however your points will revert to the registered class.